In case you missed my Instagram story yesterday, I've decided to blog every day this week! Woohoo! I'm not really sure why lol but I have a lot of content right now and I just couldn't wait to share it. Today's post is particularly exciting because I'm collaborating with a fabulous company called Busy 'n Buzzed that sells adorable disposable coffee cups. Great for parties, get-togethers, brunches, or even for the day to day. Continue ready to find out more and for an exciting giveaway! Busy 'n Buzzed has been so kind to offer all of my followers/readers the chance to win a set of 10 coffee cups (see picture above). 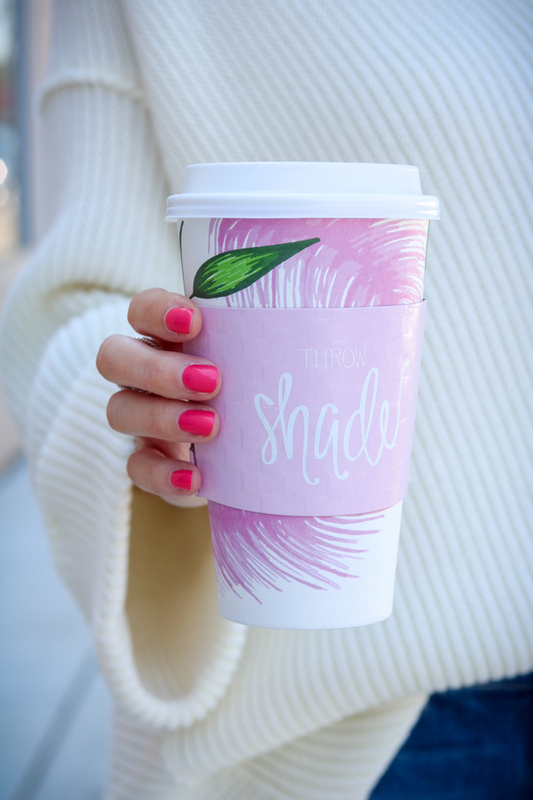 Five of the cups are pink and say "Throw Shade" like I'm holding in the pics and five are from their Adventure Awaits collection. 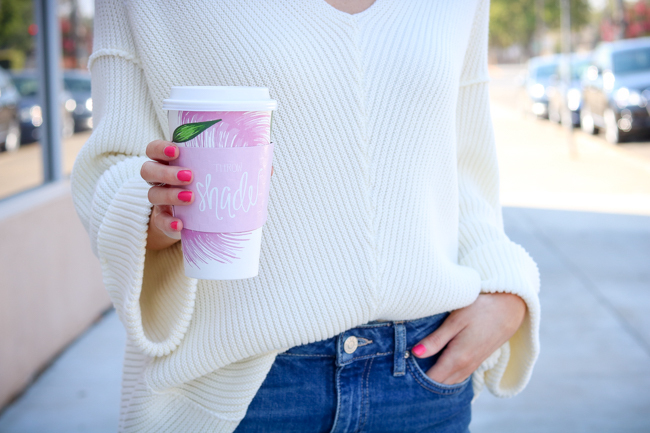 You will most definitely have the cutest cup around and everyone will be wondering what coffee shop you frequent! To enter follow the simple steps below. I've also linked my outfit above and below. Unfortunately, my cream sweater is sold out at the moment but I've linked some similar and equally cute versions at great prices. My jeans are currently on sale for less than $37! They are fantastic quality and even work well for my petite gals which is hard to come by in cropped jeans since many can make you look shorter. I paired them with a pair of pink quartz sandals, a popular color for fall this year so don't pack up your pinks! They are the most comfortable heeled sandals I've ever owned and I've worn them for hours to numerous occasion since the Spring. I added a final touch with my new pink tassel earrings - so cute and so affordable! Have a fab Tuesday and don't forget to enter the Busy 'n Buzzed giveaway.